ILE de France Cheese is giving away a a wonderful gift pack filled with cheese and goodies for you to host a party with. Just give them 3 reasons why you should win and submit it along with your name and email address. You can enter here. They also have great recipes on their site to use with their cheeses. I am sure you could use other brands as well. 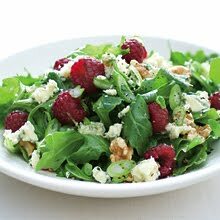 I love blue cheese in a salad and I thought this salad recipe for Fruity Spring Salad with Bleu d’Auvergne looked delicious! That salid does look delicious! Thanks for following and playing along in our blog hop! I'm here to follow you back! Thanks for stopping by and following from the Hop! I am now following your blog and following you on Twitter (AMomsWord). Congrats on winning the Vtech reader! Great tip! !